Here is a cute theme for any baby boy! 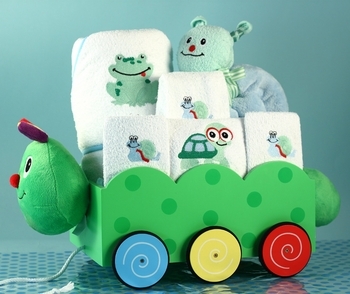 Our Baby Boy Pond Pals Gift Wagon features a colorful pull toy wagon with our popular caterpillar design. Measuring 22 inches long by 11 inches wide, the wagon is hand painted with six wheels, a pull rope and matching plush accents. You can also choose to have the baby�s name added to the wagon and personalize this gift for more impact. Please click on the More Images tab to see a personalized wagon. Inside the wagon, you�ll find a coordinated collection of the highest quality layette items which are sure to be needed for the newborn. Made in the USA of the finest cotton, we include a blanket, hooded towel, a bib, burp cloths and washcloths adorned with various pond pals to complete this adorable gift. Upon completion, everything is wrapped in clear tulle and ready to give! Please note: The wagon meets all US product safety requirements. Adult supervision is recommended for children under 3 years of age. I have been very pleased with all your products. This wagon looks so cute and all the bibs and towels are adorable! So glad I got this and can't wait to give it to my nephew! ProsIt is unusual and made very well.